Relaxing outside the house in the autumn is truly a magnificent feeling ever. It would be more so if you’re lounging in a comfortable hammock. Hammocks give us the ultimate spot for sleeping that we couldn’t get in our own beds, and that includes the serenity and that exuberant feeling of being with nature. But, not everyone can have a hammock, and although we do own one already, there is still problems involving its suspension that will always stop us from getting one. If you’re in a tight budget, things like this can be a luxury. 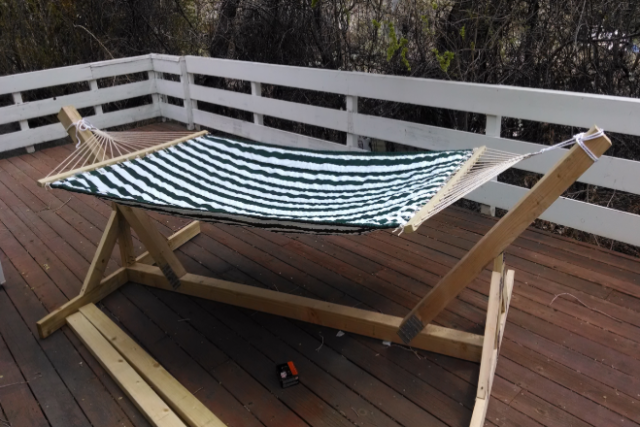 But don’t fret yet, as I’ve come up with a solution to make a DIY wooden hammock stand which is priced significantly lower than what’s in the market. Lay two pieces of lumber parallel to each other. Make a hole 5-6 inches from the end of these two lumbers. Get another 2 pieces of lumber and line them up like the first one. Make a hole at 3-4 inches from each end. Lay the first 2 lumbers parallel to each other with 5 inches space in between. Get a small scrap of wood in between as a spacer and drill holes through them. Arrange the pieces of wood like shown below and get two pieces of wood around 3 ft. each. Angle each wood at 120 degrees and insert it between the space of the assembled woods. Next, attach the bolts inside the holes and secure them with a washer. Get another 4 pieces of flat wood and nail it on the bottom of the stand. Be sure that it’s balanced enough to keep the stand from moving. Attach the hooks at the upper end of the stand. Test your hammock if you agree with its sag. 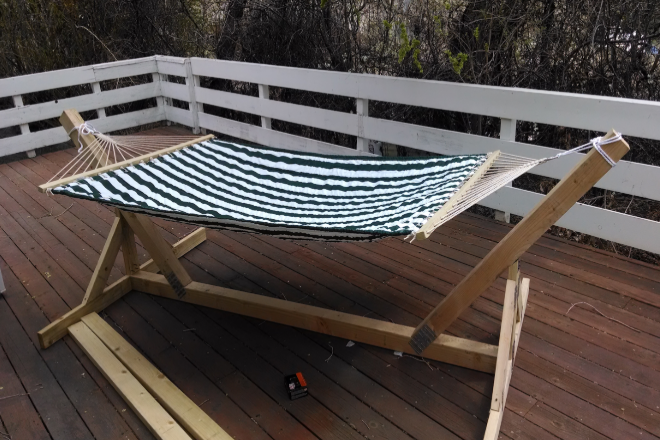 Final step is to sand the wood to get rid of rough surfaces that might damage your hammock. You can also apply a stain or varnish onto it to shield it from dirt or sunlight. As easy as that, now you can relax your way without ripping your wallet. This whole process doesn’t even take your whole day and this costs not more than 45 bucks as well!